It's time to add a wash of color to the background! I mixed some Indigo, with a little French Ultramarine Blue and a touch of VanDyke Brown. 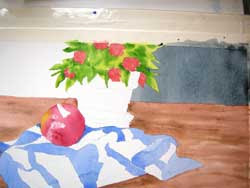 I started with a number 10 round brush and worked from the leaf area out toward the right edge of the paper. Once I worked around the leaves, I quickly picked up my one inch flat brush and completed the flat wash. I tried not to brush an area more than once. I applied a "row" of paint, then scooped up more pigment and just barely touched the brush to the already wet area, as I applied it to the next "row". After completing the right side, I turned my paper around and used the same procedure to finish the left side. Remember that it's fine (and sometimes beneficial!) to turn your board as you go. Especially when working with large, wet washes, it is a good idea to allow gravity to move the paint around the wet area. It eliminates some of the brushwork, and helps the pigment to flow evenly. Notice that the value of the paint lightened quite a bit after drying! On another note, as the holidays are quickly speeding by, I am planning to get my teaching schedule organized and I will be posting upcoming classes and workshops soon. 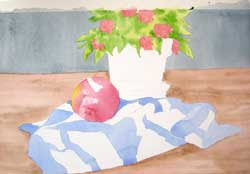 If you are interested, please visit my website: http://watercolorworksart.com/Classes.